Many people think of orchids as a southern species, reminiscent of large-flowered corsages from long-ago high-school proms. In fact, central New York has approximately 42 orchid species. Most of our orchids are small, but some New York state orchids rival our southern varieties in color and beauty (see Bob Wesley's article on the dragon's mouth orchid). This article profiles another genus of our lovely orchids, commonly called "ladies'-tresses". 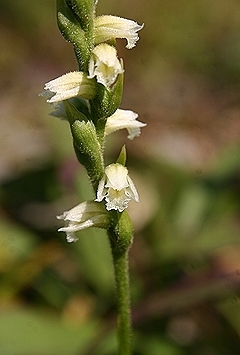 The genus name Spiranthes comes from the way the flowers 'spiral' around the stem. These orchids are small, typically less than 12 inches tall, but the helix of whitish flowers makes them eye-catching and readily identifiable. 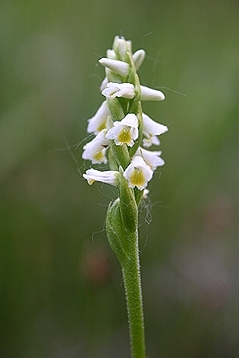 Although immediately recognizable as one of the ladies'-tresses, the similar morphology and color has led to problems in differentiating them. Now accepted as encompassing just thirty species worldwide, the genus was once thought to include over 300 individual species. It is currently accepted that North America has about two dozen species, of which less than six species are in central New York. Spiranthes lucida is the first ladies'-tresses you could be likely (and lucky enough) to see. It blossoms in our area by late June. I found it in Tully, NY, in an area with calcareous seeps, where subterranean limestone-enriched groundwater reaches the surface. This open, gravelly, limey-seep exposure is a favorite habitat for S. lucida. If you think you found it, look for the green nectar stripes on the tongue. None of our other Spiranthes have yellow centers or bloom this early. 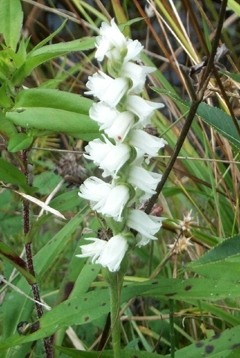 Spiranthes casei is an uncommon species in central New York. When I first encountered it during an outing in Solon, NY, I did not know what it was but I was reasonably sure it was one I'd not seen before. Fortunately, friends more knowledgeable in orchids than I came to my rescue, and a return visit led us to identify it as S. casei. It was found at an abandoned ski resort and one of the highest elevations in our area. The soil was thin and dry. Spiranthes cernua is the one most often encountered in our area. Commonly known as "nodding ladies'-tresses", it is an autumn species. I usually find it near the border of ponds but it is well known from other, drier, areas. Spiranthes cernua has flowers that are very white, not as creamy as are the other species in our area.